This is the first News Bulletin from www.musicpickups.com since it went live in 2004 (Photo of Harry DeArmond with archtop Gibson, by kind permission of the estate of Harry DeArmond). I prepared this site because I had been researching pickup manufacturers and noticed that there was a big demand for, and interest in original (i.e. ex-Toledo, Ohio) Rowe DeArmond products, twenty years after the company had ceased production. However, there was almost no information in the public domain on the original Rowe DeArmond companies at that time and most of that was incorrect, to varying degrees. 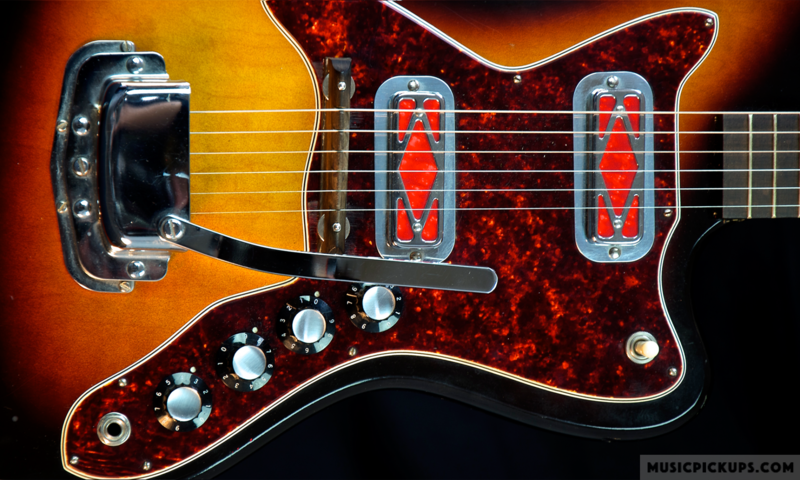 I had owned a Harmony Meteor in 1966 and had rewound one of its pickups, so I was already hooked. In December, 2001, I made phone calls to Toledo and was directed to some very useful sources. I went there twice – a major trek, as I live in Ireland – and met Harry DeArmond’s family and some ex-employees, whom I interviewed. Much investigating later, I opened a Wikipedia biographical page on Harry DeArmond in October 2004 and have largely left it alone since then, apart from some very small edits and corrections. I put some small, deliberate errors in there initially and those have not been corrected to date. This completely updated version (No. 2) of the site went live in July, 2017, and is continually being ‘fine-tuned’ and added to. Feedback has been encouraging. The list of instrument producers has been increased from 20 to 31 and a better Search facility has been included. New sections include pickup bezels and bases and DeArmond unnumbered products and will hopefully include volume and tone controls, and products that didn’t get to production stage. Items to be added include 27 DeArmond catalogs dating from 1941 to 1983 in greater detail; over 50 instruction sheets for pickups, effects and amps; advertisements and other items; detailed photos of every instrument factory-fitted with a DeArmond pickup and all DeArmond products. Technical data on each pickup will hopefully include dimensions, DC resistance, Inductance, magnetic polarity and field strength, and coil winding direction. Over 140 different DeArmond pickups have been identified to date – the most recent being in August, fitted in a Kustom guitar. Information outstanding includes catalogs not already mentioned, and other printed matter and products currently not shown on the site. Anecdotal information is particularly scarce. Ex-employees have lots to contribute and I would really appreciate those with information and willing to share it, to contact me. December 7, 2017: New section ‘Volume and Tone Controls’ added. January 6: Home page updated to show FH/FHC pickup evolution. January 25: More information on each Dearmond and CF Martin amp added.